The All-Ireland winning manager has expressed his views on the structures of the football championship and the work of Football Review Committee. 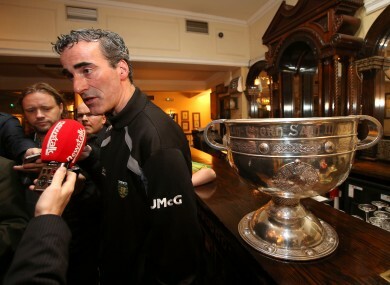 Donegal boss Jim McGuinness speaking to the media in the Burlington Hotel yesterday morning. DONEGAL MANAGER JIM McGuinness believes that radical changes should be made to the existing championship structure in order to rectify the current imbalances that exist between the provinces. The Glenties man reckons that the provincial championships should be scheduled earlier in the year and the winners then be seeded in an open draw in the All-Ireland series. “I think if the provincial championships were set up in a way that created a situation where the winners were seeded out of the provincial championship in February, March or April instead of the national leagues. “They could be seeded into the All-Ireland series and an open draw then happen. You’d have the likes of Kerry against Armagh, Dublin up to Fermanagh and all these kind of things. It’d be a far more honest and transparent championship then in the All-Ireland series. McGuinness has also questioned the reasoning behind the creation of the Football Review Committee, headed by Eugene McGee, which is currently undergoing a significant study of the rules and structures in the game. The 39 year-old believes suggestions that the FRC was established in the wake of last August’s All-Ireland semi-final between Dublin and Donegal are ‘staggering’ and ‘over the top’. “To get a review set up on foot of it is over the top being honest, the reaction to it. I was listening to the radio one day coming home from one of the qualifiers and I think it was Declan Darcy on the radio and he made the comment that the review was set up on foot of our game with Dublin last year. “It was staggering to be honest with you. That a whole consultation process at national level could be based on one game. We had a game plan, we felt we were early in our development and we weren’t read you take Dublin on. We went out with a certain game plan to try to counteract that. We felt it was the best way of winning the match. Email “McGuinness seeks changes to championship format”. Feedback on “McGuinness seeks changes to championship format”.